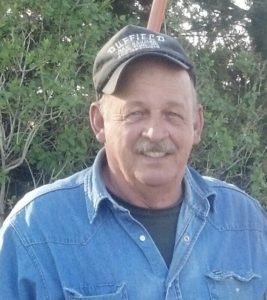 David Lavern “Dave” Duffield Sr. was born in Ainsworth, Neb., on May 24, 1951 to Harold and Ellen (McNamee) Duffield, and passed away on Aug. 21, 2018 at the University of Nebraska Medical Center Clarkson in Omaha, Neb. Dave grew up near Long Pine, Neb., on the family farm. He attended school in Ainsworth. He was united in marriage to Jane Moore on Sept. 11, 1970 at Ainsworth. In February of 1971, Dave was drafted into the United States Army, and was stationed in Edgewood, Maryland. Dave and Jane were blessed with two children; David Jr., and Connie. Dave worked many jobs including operating heavy equipment, well drilling, and truck driving, before starting his own business, Duffield Hay Hauling. He made many friends through the years of hauling hay up and down the road. Dave was preceded in death by his parents, brothers, Gene and Larry, and sister, Shirley; as well as nephews, Patrick, Bucky and Rocky. He is survived by his wife, Jane of 48 years, son, David Duffield Jr. and wife Lisa of Hickman, Neb., daughter, Connie Bellingtier and husband Greg of Elgin, Neb., grandchildren, Payton Partida and husband Matt, Katie Vakoc and husband Lance, Dillon Duffield and Grady Bellingtier. Great-grandsons, Maximus and Atticus Partida. He is also survived by his brother, Harold Duffield Jr. and wife Lillie of Grapeland, Texas and sister, Dorothy Cochran and husband Sam of Sublime, Texas; sisters-in-law, Jean Duffield of Elko, Nev. and Zellite Duffield of Kansas City, Kan.
Preceded in death also are: sister-in-law Charlotte Williams, mother and father in law, Barb and Hugh Moore. Also surviving are: brothers and sisters in law Dennis and Sherry Moore of Douglas, Kan.; Don and Colleen Moore of Madison, Wis.; Lowell and Cathy Moore of Denver, Colo.
Funeral services were held on Aug. 27, 2018 at Hoch Funeral Homes in Ainsworth. Pastor Georg Williams officiated the service. Burial followed at the Grandview Cemetery with military honors being provided by the Long Pine American Legion Post #260. In lieu of flowers, memorials were suggested to the family for a future designation.